If you’ve ever bought pine nuts in the store, chances are you’re eating Chinese imports that are often of dubious origin. And even if you are vigilant about where your pine nuts come from and buy, say Italian pine nuts, you may get high quality, but you pay for it through the nose. Why aren’t there American pine nuts, you ask? Well, there are. You just have to go find them yourself. Harvesting your own pine nuts requires some persistence, but this tutorial should help you get started. First off, you really must live in the West to do this. 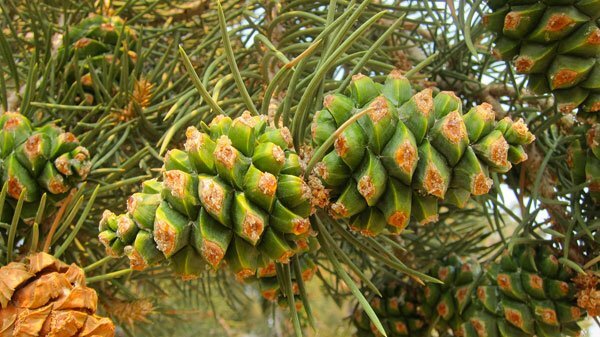 Unless you can find a stray Italian stone pine planted somewhere as a landscaping tree, eastern pine nuts are too small or have shells too hard to bother with. Sorry, guys. 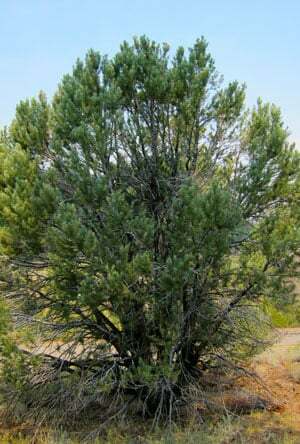 If you are in the West, you are mostly looking for two types, both called piñons: Pinus edulis and P. monophylla. Yes, a few other pines have good-tasting nuts, chiefly the sugar pine and the gray pine, which I’ve written about before. But the real action is with the two piñons. Pinus edulis is mostly a tree of the Southwest, and you can look for is from San Bernardino County in California to most of Arizona, New Mexico and Utah, southern and western Colorado, two southern counties in Wyoming, and two counties outside of El Paso, Texas. Pinus monophylla is a Great Basin tree, and you’ll find it on the eastern side of the Sierra Nevada in California, as well as throughout SoCal, almost all of Nevada and Arizona, all of western and southern Utah, two southern counties in Idaho, and, weirdly, Luna County in New Mexico. Both are rather scrubby looking pine trees that like the high desert. The tree at right is a singleleaf piñon — P. monophylla — in eastern California and is typical of the species. P. edulis, the two-leaf piñon, is similar-looking if not even scragglier. Once you find some trees, start scoping them out in early August. You’re looking for trees that have lots of green pinecones on them. Not every tree will set cones, and only Mother Nature knows why. But you can find loaded trees next to barren ones. Sometimes small variations in elevation or whether the trees are on a north or south face of a slope can matter a lot. Once you find the trees, remember where they are. Return to them around Labor Day. It sounds early, but you need to beat the Insane Rodent Posse (IRP) to these tasty nuts. In my spot, there are several chipmunk or ground squirrel holes under each piñon and they are just waiting for each cone to open. I am betting that the nuts are gone within 24 hours of a cone opening. Under no circumstances can you wait until October to gather your nuts, or you risk them all being scurried away by the IRP. How to gather? First, buy a cheap pair of gardening gloves. The cones are coated in pitch, a sweet-smelling sticky resin that will get on everything. It happens to be one of the most lovely smells in the world, so it’s not all bad. But your gloves will get wrecked, so be prepared for that. Pick each cone into a paper grocery bag. 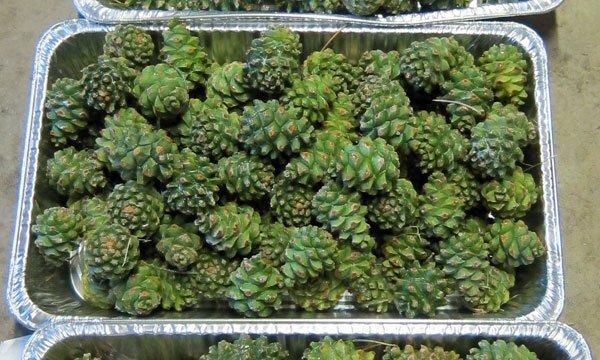 When you get home, lay the green cones out in cheap foil roasting trays or some other shallow, wide container you can stack no more than two cones deep — if you stack them too deep they can get moldy. Enjoy the wonderful aroma and wait. Eventually, they will begin to open on their own. When the cones do open, about 3 weeks or so, pick out all the nuts from within. You’ll get a little pitch on your hands, but it comes off with oil. Not all nuts will be good nuts, alas. It’s a fact of pine nut processing that can be depressing. All that waiting and work, and sometimes your yield is a crappy 50 percent or worse. It happens. At least there’s an easy way to tell if your nuts are good or not. Dump all the nuts in a bucket of water. About 85 percent of those that float are no good. The sinkers are the keepers. There is something you can do with the floaters, however. You can mash them up — most won’t have any nut at all inside — fill a Mason jar full and cover it with vodka. Put a lid on the jar, wait a few months and bam! 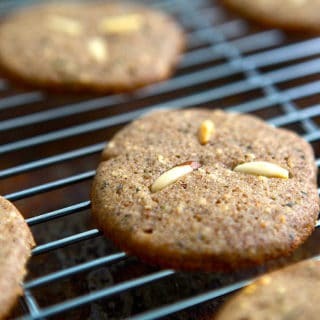 Pine nut bourbon. Damn good stuff. You’ll notice something: Dark nuts are good nuñts. The darker the shell, the more likely the nut is a good one. The nut on the left is a P. monophylla nut, the one on the right is from P. edulis. As for the good nuts, you will still need to shell them. See why store-bought pine nuts are so expensive? Sadly, there is no fast way to shell pine nuts. The most effective way is still one at a time, and believe me, I’ve tried lots and lots of different ways to shell these little buggers. This video shows it really well. 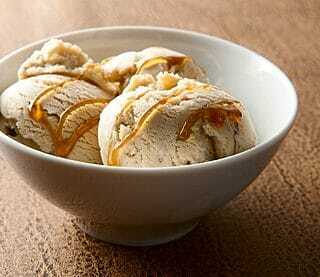 A pine nut and honey ice cream I am proud of. Awesome drizzled with desert honey, or pine syrup. Great article very interesting.I know it is late but we have been looking for the pine nuts everywhere and cannot find any for a couple years already.People selling them on street corners will not give up there location if you ask them and they charge allot. Do you have any idea were they can be found this year? Replying to Micheal who wrote about the Goshute tribe in Utah: where can I find them? Town, crossroads, etc…Would like to go out this weekend and buy some pine nuts from the tribesmen.